Alexander Aitken Ross was born in Ireland where his father was serving in the Leicestershire Regiment. After a boyhood spent in Nova Scotia and Farnham, Surrey, he entered George Watson’ College in 1871, followed by Edinburgh University where he graduated MB CM in 1893. He built up an extensive medical practice in the Southside and Newington, with his family home at 8 Newington Road. He also served part-time in the Territorial Army, becoming commander of 3rd Field Ambulance RAMC. He married Dorothy Margaret Cooper in 1913, their son Alastair Aitken Cooper Ross being born on 4th November 1914. At the outbreak of WW1 Aitken’s Territorial service was nearly over, but he asked for it to be extended and he and his unit were sent to Gallipoli in 1915 as part of the 52nd (Territorial) Division. This ill-conceived and muddled campaign resulted in many Allied casualties, mostly from sickness, particularly dysentery. The effectiveness of the Turkish forces was also seriously under-estimated. 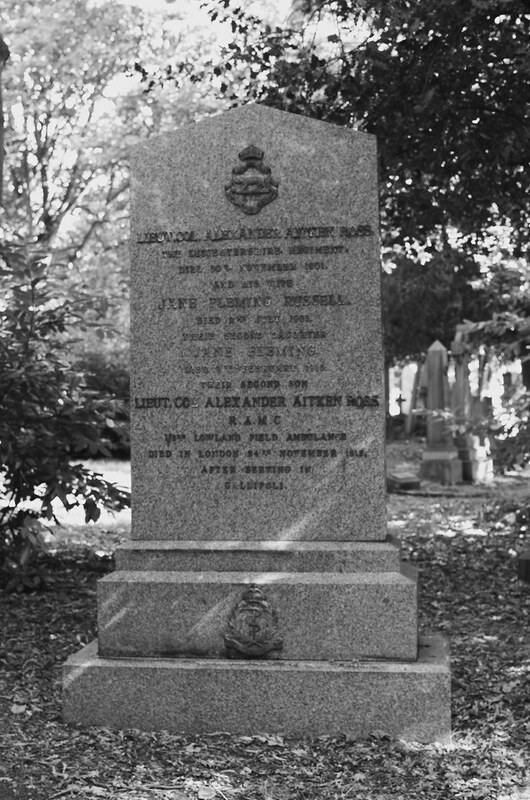 No longer young, Lt. Col. Aitken’s health gave way under the strain and he was evacuated first to Malta, then Southampton and London, where he died in hospital on 24th November 1915 from infective jaundice and heart failure, at the age of 54.